You’re not gonna believe it, but I kept my word from last week’s post. I called Tammy, the dog trainer. (Impressed, aren’t you!) Not only did I call her, but I scheduled an appointment and later resisted the temptation to cancel it. On Monday evening she came and spent an hour teaching us useful tools for keeping the dysfunctional canines in check. Since Cesar Milan is the only example of a dog trainer in my mental database, I sort of expected Tammy to be Mexican, wearing worn out jeans and a plaid, short-sleeved shirt, perhaps with a gray mustache and goatee. Surprisingly, she wasn’t what I pictured. The woman standing at my door, wielding a spray bottle like a 357-magnum, was a mixture of Girl Scout camp leader and Berkeley environmentalist; the kind of gal who combines Birkenstocks with a pith helmet and a police whistle. Impressively, Tammy got right to work before I was even able to let her in, spraying our Border Collie mix, Katie, with her water bottle, barking “DOWN, GIRL!” She continued her commands and stream of water until the unnerved pooch sought shelter under the coffee table. Although I was impressed with her “let’s get right to work” attitude, I’ve never had anyone march through my front door, wetting everything in her path, except my great aunt, Beatrice, who’s incontinent. I think if Emily Post had written a guide for dog trainers, she’d surely have suggested that they get permission before giving their clients’ properties a powerful misting. A casual “hey, do you mind if I spray water all over your house?” couldn’t have hurt. But, on the bright side, at least it was water and not sulfuric acid or formaldehyde. But, then again, who even goes around spraying formaldehyde? Why would you even put it in a spray bottle, unless you were….say….a famous frog dissector. “Dollar Tree! This thing shoots up to 100 feet,” Tammy bragged, in a tone meant to assure me that, if necessary, she could ruin my heirloom family photographs from three rooms away. Even with the etiquette gaffe, I was hugely impressed at Katie’s instant respect for Tammy. As she animatedly explained, showing me the power of the water bottle, I found my own behavior starting to improve. Behavior Modification Tip #1-Spray Bottle…check. Too bad it doesn’t work on husbands and kids. Next we got down to business on keeping Katie corralled. Remember, the whole reason behind Tammy’s visit was to keep Katie from jumping her fence and visiting everyone in the neighborhood like a Jehovah’s Witness, leaving behind droppings, rather than a copy of the Watch Tower. Rummaging through an old box of party supplies, I wondered how terrorizing Katie with a balloon would keep her home. Seems like the kind of thing that would cause her to pack her extra collar and leave for good. Before I had the chance to verbalize my question, Tammy read my mind and replied. Katie looks terrified, doesn’t she. Or just hungry. 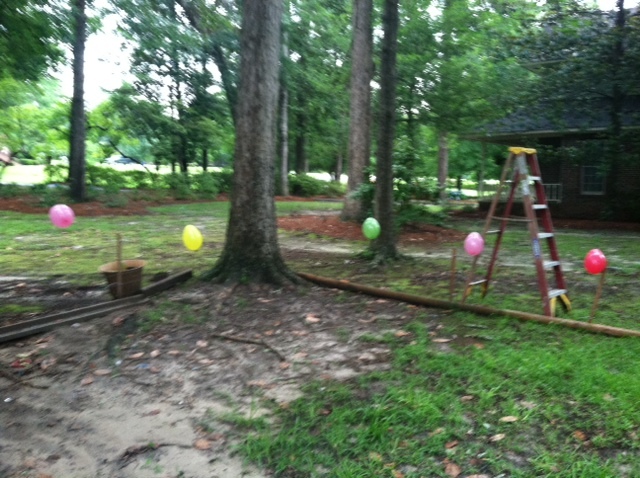 As brilliant as the idea sounded, all I could picture were the neighbors’ faces upon seeing our cheap, ugly, property value decreasing fence, all decked out with colorful balloons, as if we were preparing for a ghetto kid’s birthday party. Perhaps we could offer free pitbull rides too. I really have no idea why that ladder is there. What’s even worse is now it’s been two days since we ballooned our fence. The rains last night caused eight of them to come untied, spreading the party to three other yards. But, as promised, Katie hasn’t left her area. I’m just waiting for the “come get your freakin’ balloons off my lawn” phone call. We have three more visits with Tammy scheduled. Next week, we tackle house training. This entry was posted in balloons for dog training, balloons in dog training, Cesar Milan, spray bottles for dog training, train dogs with spray bottles. Bookmark the permalink. Are you POSITIVE this won't work with husbands? How disappointing. Did you try it and watch it fail miserably? Because I'm thinking that if someone squirted me and screamed “NO!” every time I did something stupid, I'd probably toe the line. Unless the bottle was filled with vodka. Then I might keep acting up and learn to do aim my mouth at the spray.